Vettel claims an unlikely first win of season after benefiting from pitting under the safety car. Hamilton and Raikkonen had built up a gap to Vettel but as they both came into the pits, Vettel had to stay out to try and cover off the charge of the two Ferrari powered Haas. Magnussen and Grosjean were running P4 and P5 after an impressive start to the race but then disaster struck. Both Haas suffered pit stop woes as what looks like a wheel gun issue meant tyres were not attached properly. The second Haas to pull up within a couple of laps was Grosjean which gave Vettel the opportunity to pit under a safety car and come out in front of Hamilton. There will be an inquest at Mercedes as a suspected software glitch meant Hamilton did not have Vettel covered. The data suggests Hamilton would have easily found the extra time if he knew it was required. 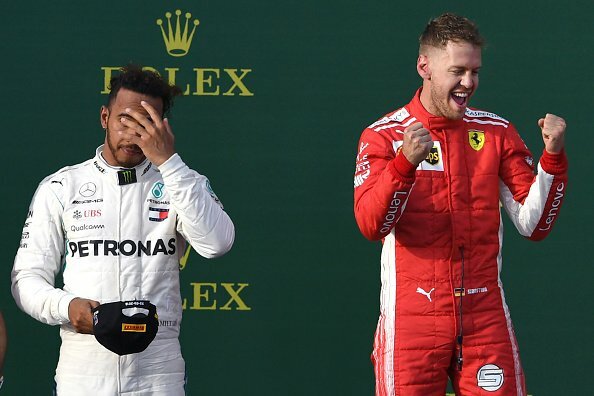 Once ahead it was going to be very difficult for Hamilton and he was unable to get close enough as Vettel who wins in Melbourne for the second year in a row. Raikkonen held on to a podium after a late charge from Ricciardo who was desperate for a first podium at his home race. The Australian drove well as he came from 8th to finish 4th but ultimately it was a disappointing weekend for Red Bull. Verstappen lost out to Magnussen at the start and then spun out trying to take the place back. It was always going to be difficult to come back from and he had to settle for 6th. Ricciardo did manage to record the fastest lap of the race to offer some encouragement going to Bahrain. Surprisingly it was Alonso who sat in between them in 5th after also using the safety car to jump up the grid and held off Verstappen to finish for the first time in Melbourne since he rejoined McLaren. Realistically McLaren are still some way off the big 3 teams but for a team notoriously good at development it’s a very encouraging start. Vandoorne finished 9th to claim a double points finish for the team at the first time of asking. Honda who? It’s not often a Mercedes will be involved in a midfield battle but after starting 15th Bottas just had to try and claim as many point as possible. The team thought 6th was possible but it was going to be a tall order to claim that many places on this track. The Finn was on the back of Hulkenberg for the last few laps but couldn’t find an opening and finished 8th. Renault will be happy to get a double points finish with Hulkenberg holding onto 7th. Carlos Sainz looked impressive all weekend but was complaining of nausea during the race and ended up in 10th. He still managed to thwart a late challenge from Sergio Perez in the Force India as the pink panthers came in 11th and 12th. Charles Leclerc had a great first race in formula one as he finished 13th in the Sauber. The expected backmarkers of 2018 finished in front of Stroll in the Williams and Hartley in the Toro Rosso. The other first timer, Sergey Sirotkin, had to pull up his Williams after the first few laps and there’s a lot of work to do for the team before Bahrain in two weeks time. Lastly, a Honda engine failure forced Pierre Gasly to retire from the race, hopefully this isn’t a sign of things to come. Congratulations to the prancing horses, I don’t think it was fully deserved but you have to take your chances. Vettel was being outdriven by Hamilton and Raikkonen but comes away with the 25 points. The hampionship race has been set alight as no clear favourites emerge following the first race. Mercedes look fast but only manage 2nd and 8th, Ferrari have work to do but claim the most points with 1st and 3rd and Red Bull are trailing but showed some good pace. Bring on Bahrain.